The 3D consumer electronics trend reached a boiling point today when Nintendo announced the portable 3DS gaming device, a no-glasses 3D system promising simplicity and elegance for gamers seeking a 3D experience. After getting a hands on with the new gadget at E3, there is little doubt that the era of effective and sensible 3D has finally arrived. That said, here at GeekTech, we care just as much about the engine under the hood as we do about the rims on our ride, and in that respect Nintendo still has a lot to answer regarding their revolutionary portable. We've previously posted a rundown of the various 3D technologies available, and after prodding the Nintendo reps for more info, it's clear they aren't revealing their secrets just yet. However, given that the depth of the 3D effect on the 3DS can be turned up or down with a slider button, it appears that there is some degree of light diffusion happening directly in the device. I predicted back in March that the 3DS would sport a parallax barrier screen, which works by diffusing separately polarized light to each eye. This may still be the case, but the specifics of how Nintendo is controlling the degree of depth is still a mystery. Nintendo announced a robust Wi-Fi system-to-system communication mechanism that will transmit data on games you aren't even playing to other 3DS devices you may encounter in public. As awesome as this sounds for my Pokemon collecting game, I'm most worried about reliving the horrors of my WEP-only Nintendo DS. Expanded security options are a must for a new system and while you're at it Nintendo, please future proof your system and add some Wi-Fi N connectivity, too. The DS always felt stuck in the past in terms of hardware specs so a more future-thinking engineering design would help keep this device relevant in the eyes of geeks for years to come. The 3DS sports three cameras, two on the back for taking 3D pictures and one front facing camera for head-tracking. But how many megapixels are we talking here? The DSi had one 3-megapixel camera and one .3-megapixel camera, but I'm hoping Nintendo we'll do much better than that for the 3DS. The prospect of having a device that can take and display 3D pictures will be a massive selling point for the consumer market, but it'll need some good specs around that camera to ensure longevity on the gadget scene. From my hands-on with the device, I was not impressed at all with the picture quality. The 3D effect was great and fun to play with, but the actual pictures themselves would've looked horribly ugly on a typical 2D screen. 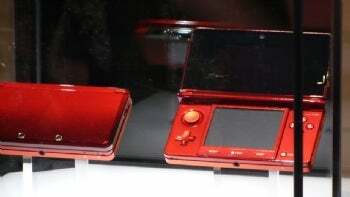 The 3DS features a touchscreen, the same feature that made the orginal DS a huge consumer success. The Nintendogs demo being showed by Nintendo allowed people to use a stylus to control the screen. While it worked great for this game, I wonder if Nintendo has ignored the huge multitouch gaming scene taking place on the iPhone. The DS platform has always prioritized interface before looks or hardware, so adding multitouch is something that can feel at home with the device, not to mention it would add another dimension for game designers to play with. There's a lot left to uncover on the 3DS. What kind of beefy processor lies under the hood to power the 3D full motion pictures Nintendo is promising? What about screen resolution and that funky IR port on the back of the device I held? For the moment, Nintendo is mum on releasing any more info. I'm sure all the attendees at E3 gushing about Kid Icarus and Star Fox speaks volumes about the device for the time being. Hopefully by the time the Tokyo Game Show rolls around later this year, Nintendo will be ready to spill whole can of beans on their portable wonder.